Grass used to be the normal surface for greyhound tracks. It looked good and provided fast races. On the other hand, it was too difficult and expensive to maintain, especially during the winter. Loam and cinder surfaces were also popular in the past. Today, sand, or a mixture of sand and clay, is the surface of choice. All greyhound tracks are regularly maintained to ensure the safety of competing greyhounds and the fairness of the outcome of the races. The surface of the track is watered and then flattened by a process called "rolling". Greyhound tracks are also distinguished form other types of tracks by their mechanical lure - a stuffed rabbit that greyhounds chase around the track. 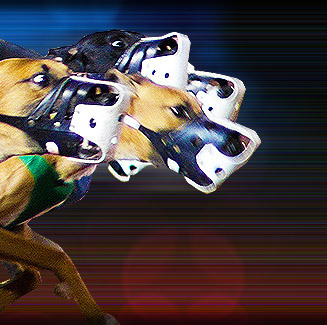 The mechanical lure was invented and used for the first time in England in 1876, six greyhounds raced on a straight track behind a mechanical lure, but this did not capture the interest of the people. Owen Patrick Smith invented the first mechanical lure that could circle a track. He opened his first track in 1919 in Emeryville, California, USA. But Smith's first venture into greyhound racing proved unsuccessful, despite the fact that he drew a great deal of interest. However, Smith's efforts served as the foundation for the development of modern greyhound tracks and the greyhound racing industry. The following is a list of US greyhound racing tracks.